When looking for the right dental office, you may not be thinking of state-of-the-art technology. At Mitchell Smile Design, we’re always updating and incorporating the latest dental techniques and technologies, but you may never notice. When we choose a new technology for our office, the goal is to make visiting the dentist more comfortable and convenient and to improve the treatment process and results. While you may not notice our advanced technology, you will definitely notice how easy and comfortable it is to visit our team for all of your dental care needs. If you would like to learn more about our advanced dental technology, we invite you to call our friendly Oklahoma City dentist and team. We’ll be happy to talk to you about our innovative dental technologies and schedule an appointment, so you can experience them first hand. Traditional dental x-rays needed to be painstakingly developed onto large sheets of x-ray film using hazardous chemicals. Once we had these images of your smile developed, they were often not very clear, and they had to be viewed on a specialized light board. Then, the x-rays were stored in large, bulky filing systems. That’s all while you were in the dental office. If you needed to share the x-rays with a specialist, dental lab, or insurance provider, they had to be physically shipped. Digital x-rays have significantly improved every step of the x-ray process. The capture speed is much faster for digital x-rays, so spending minutes with large, painful pieces of plastic wedged in your mouth is a thing of the past. Instead, we can capture all the necessary x-rays in just a few moments. Then, the crystal clear images are instantly displayed on chairside computer monitors where we can enhance them as necessary. Best of all, treatment time is significantly shorter since we can immediately transfer the digital files to our dental lab, a specialist, or your insurance provider. If you’ve ever had a dental impression, you were likely asked to bite into a putty material and hold it in your mouth for several uncomfortable minutes. Then, if you accidentally shifted your teeth, you were probably asked to repeat the process. 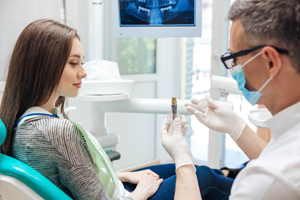 Once the right impressions were captured, your treatment plan had to wait as the dentist mailed the physical bite molds to a dental lab where a restoration or oral device would be manufactured and sent back to us. 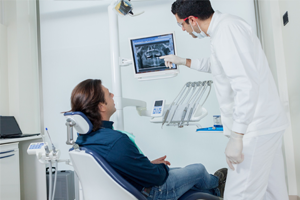 Like digital x-rays, digital impressions allow us to further streamline the treatment process. Our digital impression tool scans your teeth and oral structures quickly creating precise molds of your smile. We can view these impressions on our chairside monitor and instantly transfer them to the lab. A brighter smile is something many of our patients are interested in. At Mitchell Smile Design, we are proud to offer an innovative teeth whitening solution – Zoom! This unique treatment method uses the same professional grade whitening gel and application method that makes other in-office teeth whitening treatments so effective. However, Zoom! also uses light to accelerate the teeth whitening process. The low-heat Zoom! light serves as a catalyst to accelerate the chemical reaction that lifts stains off of your teeth. A picture is worth a thousand words – or so the saying goes. At Mitchell Smile Design, we couldn’t agree more. 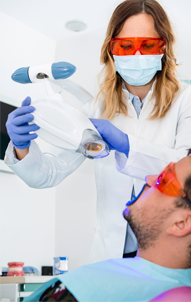 There is no technology that has improved the patient experience in the dental office more than our intraoral camera. This tiny camera that resembles a large pen captures high definition images of the smile. We can then display these photos on a chairside monitor. 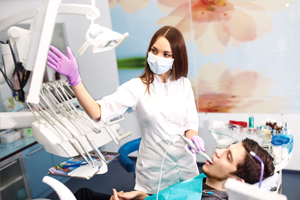 By showing patients areas of dental wear or decay and having them find the area in their mouth, patients better understand the need for changes to at-home hygiene plans. We can also more easily describe treatment methods, so patients have a better understanding of their treatment plans and feel confident moving forward.